Welcome to Kern Steel Fabrication, Inc.
Kern Steel Fabrication, Inc. (KSF) is well known in the industry as a structural steel fabricator that consistently meets or exceeds contract requirements and client expectations. This directly reflects the diligence and attention to detail of everyone at KSF–from the president of the company to the dedicated sweeper who constantly sweeps the shop to provide a clean and safe work area. Most clients are not aware that KSF is also a national leader in the design and construction of aircraft ground support maintenance platforms, work stands, and docking stations. Platforms have been designed and fabricated for everything from the Boeing 737 and 747 to all of the maintenance platforms required to complete isochronal maintenance for the Lockheed C-5. Current contracts include design, construction and installation of all maintenance platforms required to complete isochronal maintenance of the Lockheed C-130 and work platforms for performing wing maintenance of the C-5. Kern Steel’s aircraft ground support equipment can be found across the United States in places like Little Rock, Arkansas; Fort Worth, Texas; Martinsburg, West Virginia; Dover, Delaware; and Westover, Massachusetts. Check out images and details of Aircraft Docking and Maintenance Systems projects. KSF stands out from others in this market. 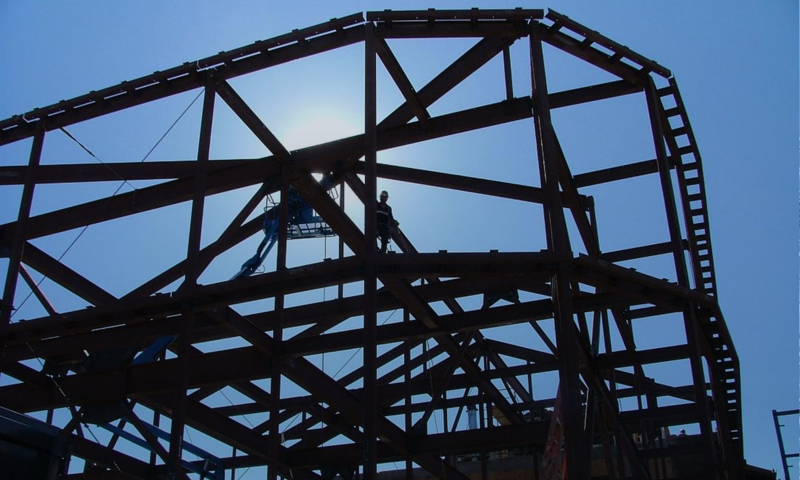 Licensed by the State of California and the City of Los Angeles to fabricate structural steel.